We have been on the road with our tiny home for about four months and have had a very rewarding time studying marine life and hopefully influencing others to live smaller and more economically-conscious lifestyles. We began our tiny house journey to help alleviate logistical challenges and reduce costs of our whale expedition, in hopes to also lead by example and show others that they can impact the environment in a positive way. We have stopped in Longue-Pointe-de-Mingan for now, where the whales are abundant, and have been able to give tours of the tiny home and get to know the local residents. Some locals have even helped us install electrical upgrades to our traveling research hub! Throughout our expedition this summer, we have studied thirteen unique whale and dolphin species found in the Gulf of St. Lawrence and along the coast of Canada. Even though they live close in proximity, each species is incredibly different. We have seen about 50 humpback whales and 50 fin whales so far. In addition, we have seen 3 humpback whale calves –one of which was so curious, that he circled around the boat several times (with his mother keeping a close eye, of course)! 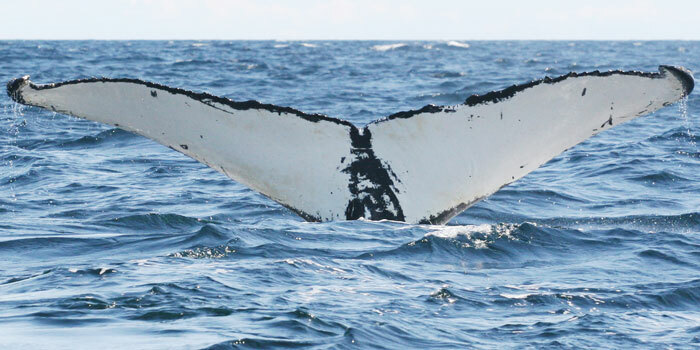 Among the humpback whales we have seen, many are animals we have known for several years. Splish, for example (shown below), was first photographed on an expedition in 1980. When we spotted Splish this year, she was accompanied by another whale we have known since the 80’s, a female humpback named Tracks. Splish and Tracks appear to have established a long-term association, since we have seen them together frequently over the last six years. Our next stop will most likely be in a small city located in the Estuary of the Gulf of St. Lawrence, Rimouski. 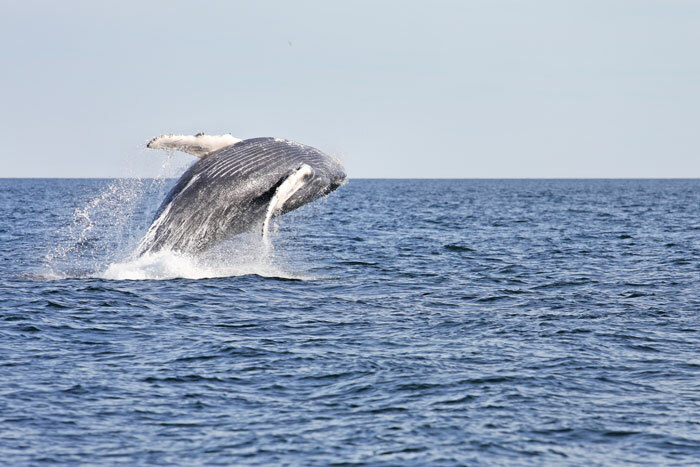 In Rimouski, we will get the chance to study different whale species, like the endangered blue whale. To continue to follow our journey and learn more about the many whale and dolphin species we encounter, please check back! In closing, we’d like to share what we believe are interesting facts about some of the species we are following. Enjoy! Blue whales (or Balaenoptera musculus) are the largest animal to have ever lived on earth and can be recognized by their unique blue/grey pigmentation pattern. A blue whale’s tongue weighs about 2.7 tons (the weight of an elephant) and its mouth can hold up to 90 tons of food and water! The fin whale (Balaenoptera physalus), the second largest animal after the blue whale, is the one of the only mammals to have asymmetric body coloration – their right lower jaw is white while the left lower jaw is dark-colored. The male humpback whale (Megaptera novaeangliae) sings to attract females as a type of courtship display and in addition, their singing may also be used to establish dominance among males. Just like humans, female humpback whales have been known to have long-lasting associations with other females.